home, away from the family traffic, to allow the mother solitude. twenty-four hours before the onset of labor, the rectal temperature drops nearly two degrees. the mother to allow her to urinate and defecate. contractions. After or during delivery, the mother opens the sac, cleans off the pup and severs the umbilical cord. You may have to perform these functions for the mother. Make sure the sac is removed from the puppy immediately if it is unbroken during delivery. afterbirth occur in this phase. This stage usually lasts 10 to 30 minutes, but it may range from a few seconds to an hour. alcohol to the cord end after it is cut. may not be time to call the clinic. Grasp the puppy with a clean towel and exert steady, firm traction. DO NOT JERK or pull suddenly. Traction may have to be applied for as long as five minutes. If you cannot remove the puppy, you need veterinary assistance. protectiveness for her new family. Any aggression she may exhibit usually fades as time passes. * You cannot remove a puppy lodged in the birth canal. * There is a strong, persistent labor for sixty minutes without delivery of any puppies. * There is weak, intermittent labor for six hours without delivery of any puppies. 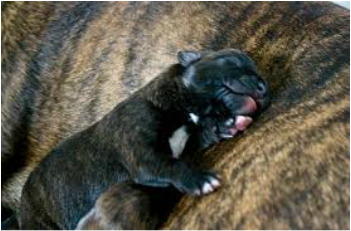 * It has been more than five hours since the last birth and it is probable that more pups are still inside. is normal, but such a discharge should be followed very soon by the delivery of the pups. her an injection to help her uterus begin returning to normal size (involute) with as few problems as possible.